Its been quite a while since I published a blog post, there has been so much happening around, two new jobs, moving from the south to the north island and back to the south. In late October, I was having a chat with a friend of mine (a fire engineer like moi) to provide me with some free lancing jobs. I was taking a break from work to settle a few personal stuff and I thought it would be good to be in touch with my career, make some money but not have the pressures of a 9 – 5 job. However, since he himself was busy, we finally decided that me flying down to his office would be the best way to go, the plan would be me spending a month or so, clearing out the backlog before I went home. 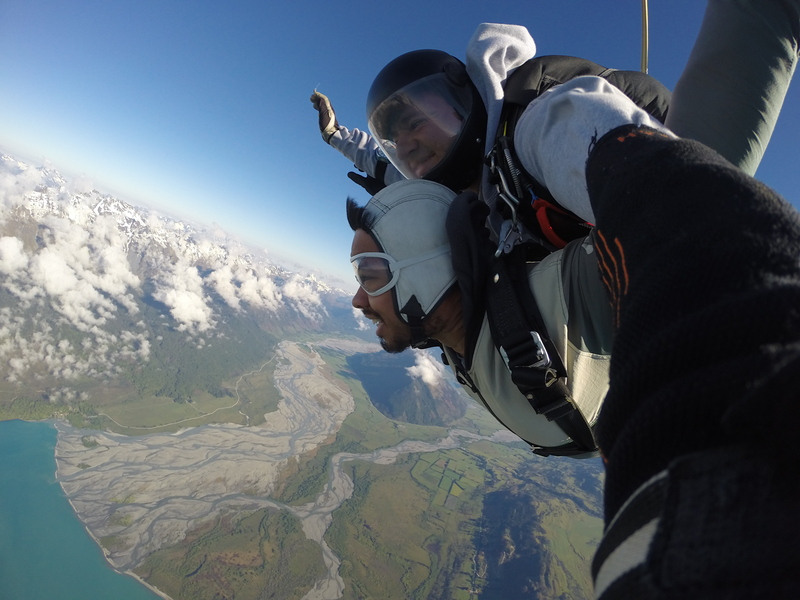 In all this, I got a chance to do a site visit to Queenstown and finally coming close to finally completing my skydive. When I was in Qtown a couple of years back, I had managed to do a Paraglide and a swing over the Gondola, but missed out on doing a skydive. Fast forward and I am standing in the NZone office for a 3pm jump. We bundle up into the bus with a chatty Brazilian (Julian) and were off to the drop off point. En-route, Julian was skeptical on a jump, apparently the slightly rustling breeze meant that the winds speeds were high up there. Nevertheless, keeping my fingers crossed and my fears in check I headed into the small office. There was a lot of smiling faces in the lounge areas and lots of videos with people doing crazy stuff, a few paragliders were finishing off their jumps and just when our lot was ready to go through the process, we had a status update. The wind up there had picked up. A few minutes later, the session was called off. Arghhh…. I’m actually doing this…. Girl: So, would you like a refund? Girl: 6:30am tomorrow? You wanna do that? After what seemed like ages, she wrote me a ticket for a 6:30 jump on the 26th of November, 2017. My head blank, I listened to Julian mumbling away as I headed home. The next day, I woke up early, only to be disappointed again, the 6:30 jump was cancelled due to bad weather. Was this a sign? Don’t jump !!!! Bah…. Me: Could I do a jump sometime now? Guy: Ummm, we’ve got a 7:30 one from Glenorchy, its a different jump spot, would you like to do that? Another form to waive off from putting the company in trouble, just in case something went horribly wrong with the jump. Interestingly the person who was incharge of booking us in for the Southern Alps Jump, was also the bus driver. I was with an interesting bunch of people, a honeymoon couple, a group of college grads who were on a world tour, a emo girl and a dude from Germany who talked in chill-tone. After a 45 minute ride hugging the rugged mountains, we were at our drop off point, a quick demo and advice on the perfect posture to skydive and off we were to meet out jump masters. Guess what, I was the first person on the list !!!!!! Yay !!!!! Roberto: So I will be your jump master and your Ram……kumar….. how do you say that? Me: Ummm …… Ummmm….. First jump, its going to be fun. Me: Sure is …….. If I get down in one piece(mind voice) …………… What if……. Arghhhhh…………Why am I doing this………………Arghhhh…………Mom, love you……….. Arghhhh……Sis, na na nana. Roberto: Move Ram !!!! Move………Remember RAM…. be like a Banana !!!! Achievement Unlocked… like a Boss !!!!! And here is the video of the jump.